High redshift quasars, bright galactic nuclei in the distant universe, can be used as flashlight beams to illuminate intergalactic material along our line of sight to them. 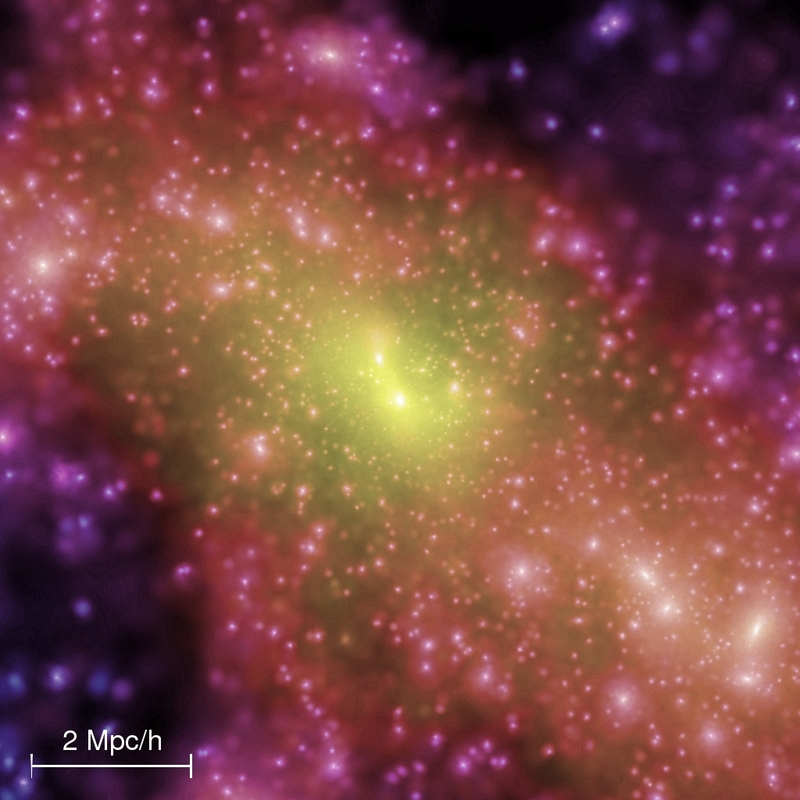 In a recent Astrobite, we discussed how these quasars can serve as probes of the epoch of reionization when they allow us to measure the ionization fraction of gas clouds in the early universe. In a new paper published by Science, Fumagalli et al. demonstrate another application of these sightlines – helping us to understand how metals (heavy elements) were first formed in the universe. The standard cosmological model, which correctly describes a great many observations of the universe, confidently predicts that the Big Bang left us with only H and He. Over the next 8 Gyr, galaxies like the Milky Way were enriched with enough metals to produce planets like the Earth around stars like the sun, which have ~2% metal content. But if we look to very old stars or objects in the universe’s distant past (high-redshift sources), we expect to find objects with near-zero metallicity. The problem is, even the most metal-poor stars we can find in our galaxy and all the most distant systems studied to date still have measurable metallicities – at least 10-4 the solar value. Perhaps surprisingly, the high-redshift quasars themselves seem to have metallicities that are actually higher than solar. So where are the “primordial” systems free of metals? Fumagalli et al. think they have found them in LLS1134a and LLS0956B, a pair of gas clouds at redshift z~3 (~2 Gyr after the Big Bang). The clouds were discovered based on the Lyman series H absorption lines they imprinted on two different quasars, as detected on high spectral-resolution Keck HIRES spectra taken in 2006. The designation “LLS” (Lyman Limit System) implies that the density of the clouds (n~10-2 H atoms/cm2, optical depth τ ~ a few) are significantly higher than typical Lyman forest absorbers, but not as dense as damped Lyman systems. Of course, what makes these gas clouds interesting isn’t the H features they do imprint on the quasar spectra, it’s the metal features they don’t imprint. Based on the absence of these features, the authors estimate an upper limit of the metallicity of these systems of ~10-4 the solar value – more than an order of magnitude lower in metallicity than any system previously observed in the early universe (see figure below). A census of physical properties of objects observed in the early universe (z>2). The y-axis is metallicitiy and the x-axis is the density of the different objects. The two newly-discovered clouds are denoted by green arrows. One assumption that goes into these metallicity calculations is the ionization state of the system. For example, you can’t predict how much Si III (Si++, doubly-ionized Si) emission will be produced if you don’t know what portion of the Si is doubly-ionized. Based on observations of other LLS, the authors assume a ratio of the flux of ionizing photons (Φ) to the density of gas (n) of U=Φ/(cn)=10-3 (U is called the ionization parameter). The gas in LLS are thought to be ionized primarily from UV photons from young stars in galaxies that may be many Mpc away. On the one hand, this discovery is reassuring in the sense that we always expected to find primordial, metal free systems in the early universe. On the other hand, these clouds emphasize the need for theories for the formation and dispersement of metals to explain why we can see metal-rich quasars as early as z~7, but also metal-free clouds much later at z~3. This opens up lots of interesting possibilities, including the formation of Population III stars in the relatively nearby universe (and perhaps their death in exotic supernovae). The only other observed features of the gas clouds are their deuterium (2H) Lyman series, which is offset from the 1H Lyman series by 82 km/s. 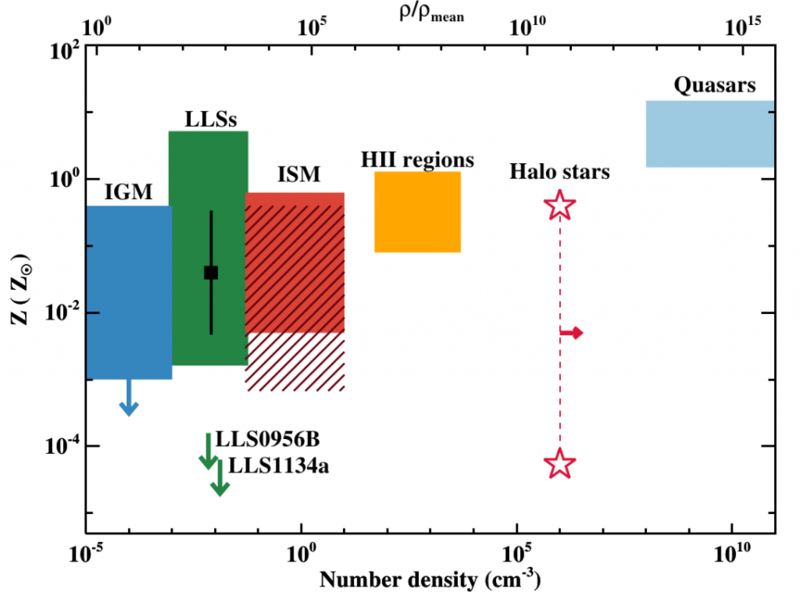 Based on the relative strength of the 1H and 2H absorption lines, the authors calculate a deuterium abundance that is 10-4.6 the hydrogen abundance – exactly the value predicted by Big Bang Nucleosynthesis models given the initial cosmic baryon (ordinary matter) density (Ω b) measured from the CMB. I would assume you meant “metal-free clouds” instead of “meal-free clouds” in the second to the last paragraph, right? Thanks for such a good summary for this paper!